September is California Wine Month, a period of time where wineries and vineyards across the state open their doors to the masses for plenty of tastings, unique festivals, and more. This is the perfect time to celebrate your favorite winemaker or even try a few new varieties, expanding your palate and having tons of fun along the way. Celebrating California Wine Month doesn’t have to be expensive though, because staying at a Martin Resorts accommodation this September includes a variety of exclusive deals and discounts available only to their guests! This is the perfect opportunity to explore the Central Coast’s wine country, from Paso Robles to San Luis Obispo. 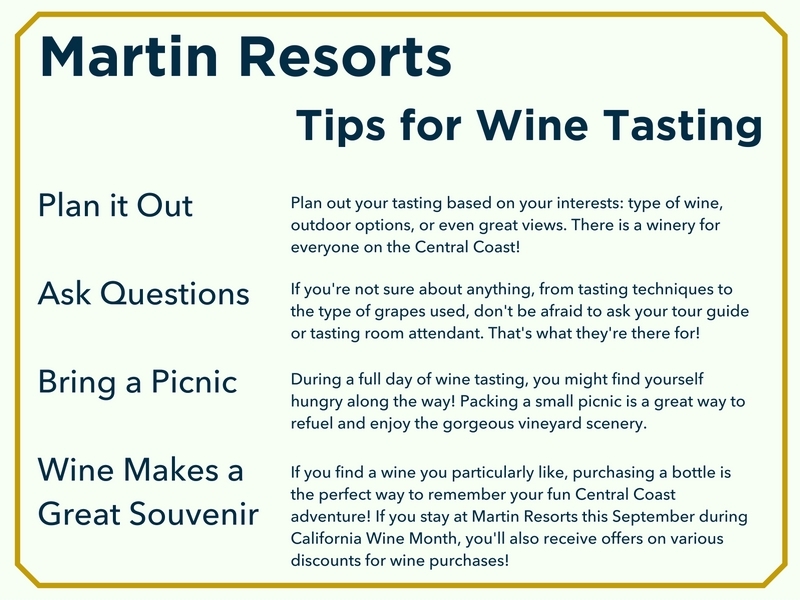 At Martin Resorts, we’ve partnered with ten different wineries to give our guests the best wine tasting experience the Central Coast could offer! 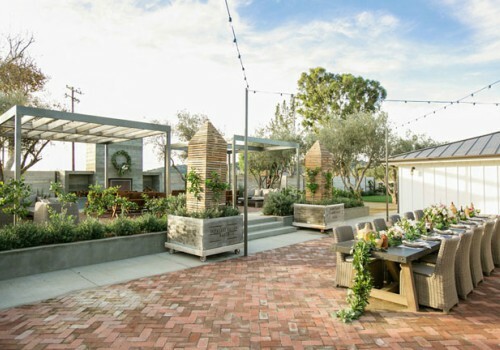 Whether you’re looking to spend you mornings relaxing on the beach at Avila Lighthouse Suites or you want the wine country feel by staying in a wine themed room at the Paso Robles Inn, you’re sure to have the time of your life this September. Interested in these amazing deals? Check out some fun facts about the wineries we’ve partnered with and our tips for creating the perfect wine tasting experience! • Owners Bill and Teresa were originally looking for a place to retire and raise their twins when they found this vineyard. 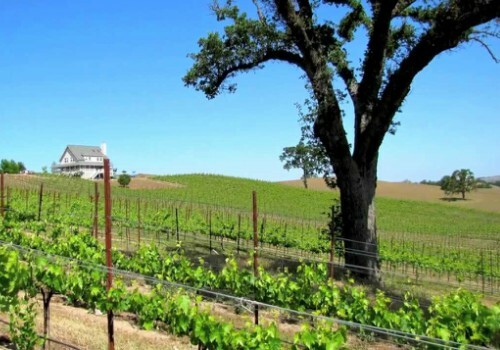 • The vineyard overlooks the beautiful Pleasant Valley in Paso Robles. • The first vines here were planted around 1970. • Ray and Pam Derby moved to the Central Coast also with the intention of retiring. • They have nearly a decade of experience in grape growing. 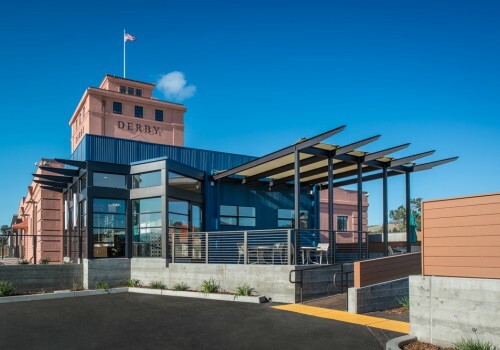 • The building here was originally a warehouse and processing plant for the Paso Robles Almond Growers Association. The Derbys completely rehabilitated the building! • Owner Tom Maas was stationed on an army base situated on a German vineyard in the 1960’s, which sparked his love for wine and vineyards. • The vineyard started with only 20 acres in 1999 and has now grown to 113 acres. • They practice sustainable farming techniques. • The winery’s goal is to produce wines with a combination of California and Italian styles. • Owner John Backer’s family has been growing grapes for four generations, since the 1800’s! • These wines are often crafted by hand using small open tap fermenters. 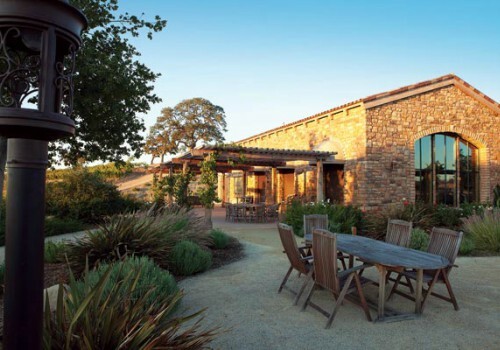 • The winery is nestled in a secluded valley along the coast ranges, west of Paso Robles. 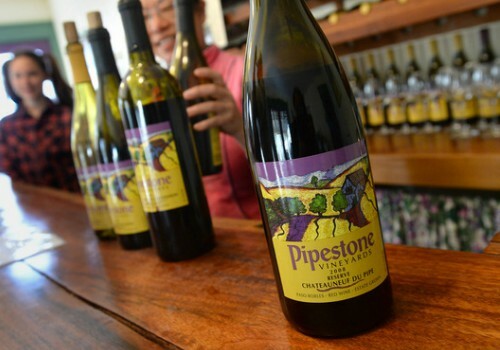 • It overlooks the Templeton Gap, which brings cool, coastal breezes to the vineyard. • They follow a traditional European model of wine making. 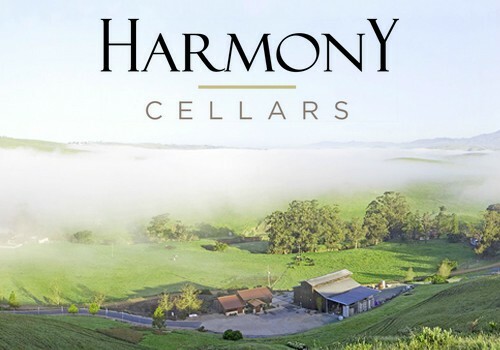 • Harmony Cellars is a small, family-owned winery committed to producing fine wines at affordable prices. • The winery has grown from a 2,000 case micro-winery to a 7,000 case boutique production facility. • Wine making in the city of Harmony, where this winery is located, is a tradition that dates back to the late 1800’s. • This vineyard was conceived by a group of friends who love fine wine, good food, and the beautiful Central Coast. • The wine maker here, Ryan Deovlet, also has experience in Australia and New Zealand. • Biddle Ranch has constructed a beautiful, new production facility and tasting room, set to open Fall 2016. 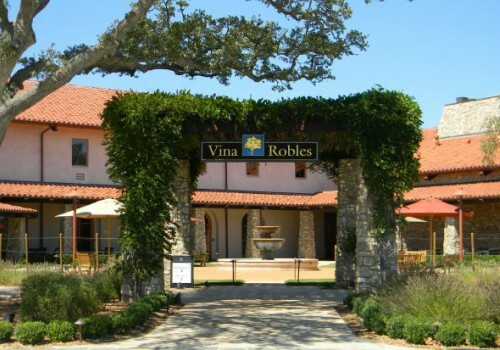 • Proprietor Hans Nef and managing partner Hans R. Michel sought to bring their Swiss heritage to the Central Coast to unite their experience at Vina Robles. 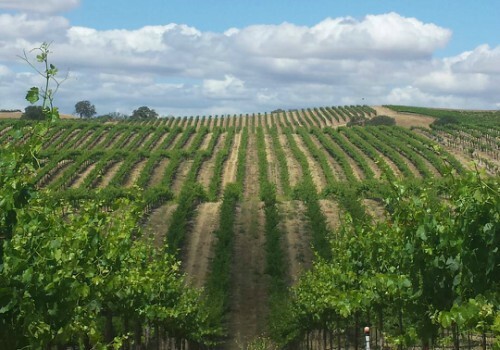 • They first discovered Paso Robles in the 1980’s and have been enamored with the rugged ranchlands and Pacific coastline ever since! • Vina Robles also has an outdoor amphitheater, where tons of music artists and performers can be seen. 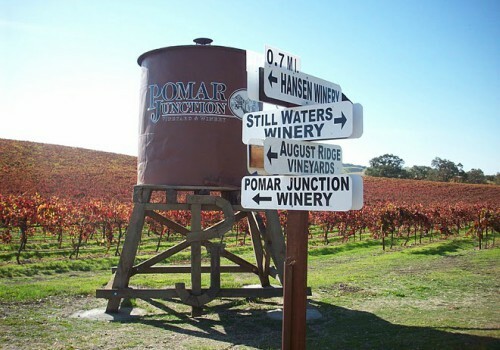 • Owners of Pomar Junction, the Merrill family, grew grapes for other California wineries for 30 years before producing their own wines. • Dana Merrill was the first San Luis Obispo County Chair of the California Association of Winegrape Growers. • The Merrill family has been involved in grape growing and agriculture on the Central Coast for 8 generations. 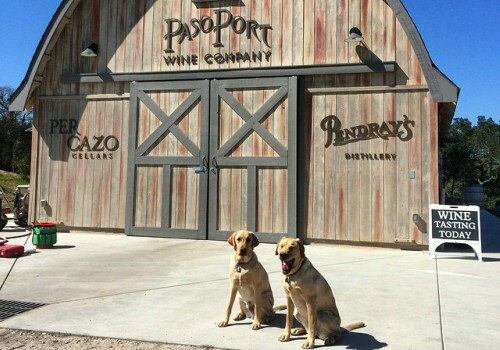 • PasoPort was created by wine maker Steve Glossner and his wife Lola, who started his career at another Paso Robles Winery, Justin Winery. • Steve has also worked for Adelaida Cellars and Halter Ranch Vineyard. • PasoPort is a ten year old family winery with production of about 1,500 cases focusing on port-style wines.